IoT or "Internet of Things" refers to a network of devices or objects incorporating embedded technology that enables them to communicate with each other, even at far off distances. The connectivity can happen between innumerable devices like smoke alarms, appliances, light fixtures, and more. The technology can be used for smart gadgets, which can be controlled and accessed from a remote location. Just like the way it touches numerous industry verticals, there has been an innovation of IOT Development, which is the newest mobile app development process. 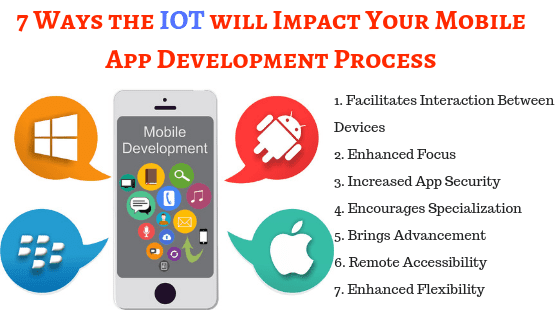 If you want to know the various ways IOT can impact your mobile development process then here know the top 7 among all. IOT facilitates interactivity of devices thereby making it easier for the app developers as well as users to manage various tasks. The app developers are able to develop apps with fewer efforts and are also able to offer more innovative and user-friendly solutions. Previously, IOT development focused on developing applications with a user-friendly interface. But with the introduction of IOT, the emphasis is now on establishing an efficient integration between the sensors or devices and applications. The internet enabled gadgets to use user’s data, and there is a possibility that such devices may pass sensitive information to cybercriminals. IOT apps are safer and secure for the users, and hence, mobile app developers are expected to use IOT for application development. Internet of Things is a unique concept and needs specialization to be implemented in an appropriate way. IOT specific apps need additional skills, and the mobile developers need to develop such skills to remain competitive. The futuristic IOT development process needs to offer support to the linked devices. If your mobile apps do not support IOT, then they will be at risk of not meeting the market expectations. It is essential that the developers create apps that are adaptable to smart linked devices. The IOT based gadgets can be controlled conveniently with the smart devices from anywhere. This implies developers need to generate apps that allow accessibility from various locations. This will give freedom to the users from dependence on location. IOT let developers create apps with flexible accessibility. It offers you an online functionality, though for a limited purpose. It allows accessing the mobile app via a smartphone on 24 x 7 from any part of the world to control and monitor the connected devices. IOT is rapidly transforming the world, as already known. Smartphones have generated a lasting revolution in their own zones. The power of IoT is incomparable and hence, it is no more an option to consider IOT development. Rather, it has become a must for every enterprise or developer to create mobile apps embedded with IOT technology. Hence, if you want to succeed in your business, then it is of utmost importance to find out a way where IOT can fit well into your business, no matter what size.